Pope Saint Gelasius I (reigned 492 - 496 C.E.) was an important pope of the late fifth century who strongly affirmed the primacy of Rome and promulgated the doctrine of the Two Powers, insisting that the emperor bow to the will of the pope in spiritual matters. The third pope of African origin, Gelasius had worked closely with his predecessor, Felix III, especially in drafting papal documents. He continued Felix's policy of affirming the decrees of the Council of Chalcedon and refusing to compromise with the emperor and the patriarch of Constantinople regarding the Monophysite controversy, thus perpetuating the East-West split known as the Acacian Schism. He also worked effectively to suppress the celebration of the pagan festival of Lupercalia, which was replaced with the Christian holiday of Candlemas. One of the more prolific writers among the early popes, many of Gelasius' letters and several of his decrees survive, as well as some significant documents once attributed to him but now thought to be of a later date. His feast day is celebrated on November 21. Gelasius origin and race are a matter of some controversy. The Liber Pontificalis, originally dating from the ninth century, lists Gelasius as natione Afer (African). Some have asserted that Gelasius was therefore a black African by descent. Gelasius' own statement in one of his letters that he is Romanus natus (Roman-born) is certainly not inconsistent with this view. He seems to have been a man of African heritage who was born in Rome. However, the question of his race is an open one, as at the time most natives of that continent's Mediterranean shores were not black. No nearly contemporary visual representation of Gelasius, or description of his skin color, survives to settle the issue. Little is known of Gelasius' early years. In his private life Gelasius was known for his spirit of prayer, penance, and study. He took great delight in the company of monks, and demonstrated a concern for the poor, reportedly dying empty-handed as a result of his lavish charity. He was apparently the secretary and close associate of his predecessor, Pope Felix III (sometimes called Felix II because the other Felix II is considered an anti-pope). Gelasius is known to have been particularly active in drawing up ecclesiastical documents for Felix during the Acacian Schism. Gelasius' election, March 1, 492, was thus a gesture for continuity: Gelasius inherited Felix's struggles with Eastern Roman Emperor Anastasius I and the patriarch of Constantinople. Early in his papacy, Gelasius stood strongly both for the rights of papacy and for the cause of orthodoxy when he insisted that the name of the late Patriarch Acacius of Constantinople, who had tolerated Monophysitism and thereby rejected the Ecumenical Council of Chalcedon, be purged from official ecclesiastical memorials. However, in so doing, he rebuffed ecumenical gestures by the current, otherwise orthodox, Patriarch Euphemius and exacerbated the growing split between the Eastern and Western churches. The so-called Acacian schism between Rome and Constantinople was necessitated, from the western point of view, because Acacius had refused to enforce the orthodox positions that, the Monophysite heresy could not be tolerated. From the Eastern viewpoint, however, toleration of Monophysitism—the teaching that Christ's divinity overshadowed his humanity—was the lesser of two evils. In Acacius' view, the Monophysites were allies to defeat the threat from Nestorianism, which stressed that the divine and human natures of Christ were so distinct that he did not consciously share all of the divine attributes of the Father. Pope Felix had condemned and "deposed" Acacius, and Gelasius insisted that this deposition by a Roman bishop be recognized by Constantinople. Gelasius' treatise De duabus in Christo naturis ("On the dual nature of Christ") delineated the western view. Gelasius' unbending position in refusing to compromise to end the Acacian schism asserted absolutely the rights of the Roman bishop, a major step in affirming the authority of the papacy over the emperor. He rejected the emperor's claim that Constantinople was the "New Rome" in any sense other than the political one, even declining to give the city the second place in ecclesiastical honor ahead of the venerable Metropolitan Sees of Alexandria and Antioch. Gelasius thus went further than his predecessors in asserting the primacy of Rome over the entire Church, East and West, and he presented this doctrine in terms that set the model for subsequent popes asserting the claims of papal supremacy. Gelasius' doctrine—known as the "Two Powers" (or Two Swords)—differed from that of the eastern view in several ways. First, while affirming that church and state should work in harmony, it emphasized the distinction between the two, while the eastern view emphasized cooperation. Second, it clarified in stark terms that in spiritual matters the emperor must obey the bishop, and that the bishop of Rome was to be obeyed over any other, including the bishop of Constantinople. On this matter, the East held that the Roman bishop was first only in honor and had no greater authority than the other great patriarchates. Gelasius's pontificate did not achieve the complete submission of the East he had hoped for. Instead, Emperor Anastasius (491-518) became more inclined towards Monophysitism and persecuted the bishops who refused to repudiate the Council of Chalcedon. Reconciliation between Rome and Constantinople was finally brought about under Pope Hormisdas (514-23). 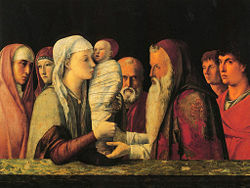 The feast of Candlemas, celebrated the presentation of Jesus and the ritual purification of Mary under Jewish law and replaced the celebration of the pagan festival of the Lupercalia. Closer to home, Gelasius succeeded, after a long struggle, in suppressing the ancient Roman festival of the Lupercalia. Gelasius' letter to the senator Andromachus covers the main lines of the controversy and offers some details of this festival combining fertility and purification, that might have been lost otherwise. This festival—also called dies februatus (from the verb "to purify"), from which we derive the name of the month of February—was replaced with a Christian festival celebrating the purification of the Virgin Mary: Candlemas, observed 40 days after Christmas, on February 2. Gelasius also exposed the closeted Manichaeans, the dualistic mystics considered as heretics, who sometimes passed for Christians and were present in Rome in large numbers. Gelasius decreed that the Eucharist had to be received "under both kinds," with wine as well as bread. As the Manichaeans held wine to be impure and essentially sinful, they would refuse the chalice and thus be exposed. Later, with the Manichaeans suppressed, the old method of receiving communion under one kind—the bread alone—was restored. Gelasius was also instrumental in establishing various traditions regarding the church calendar, finances, and the charitable obligations of bishops. After a brief but dynamic reign, his death occurred on November 19, 496. His feast day corresponds to the date of his burial on November 21. Gelasius left an important legacy in his doctrine of the Two Powers, which became the prevailing attitude in church-state relations for more than a millennium after his death. This doctrine can also be seen as laying the groundwork for the modern idea of separation of church and state, although Gelasius himself would no doubt oppose such a concept. Gelasius also did much to assert the primacy of the pope's office in relation to other bishops, as well as in relation to the emperor, laying important foundations for the mature Catholic tradition of the pope's ecclesiastical supremacy as the representative of Saint Peter. This affirmation of papal power, however, came at the expense of the unity of the eastern and western churches, prolonging the Acacian Schism and foreshadowing the Great Schism of 1054, which has lasted until this day. Gelasius was the most prolific writer among the early popes. A great mass of correspondence of Gelasius has survived: including about 40 complete letters and fragments of 49 others, most ceaselessly expounding to Eastern bishops the primacy of the see of Rome. Six papal treatises carry the name of Gelasius. Some works attributed to Gelasius, however, are apparently not truly his. The most famous of pseudo-Gelasian works is the list de libris recipiendis et non recipiendis ("books to be received and not to be received"), the so-called Decretum Gelasianum. Long accepted as authentic, internal evidence suggests to contemporary scholars that the work is from a later date. Catholic Encyclopedia: Pope St. Gelasius I – www.newadvent.org. Duo sunt – introduction and text in English. web.archive.org. This page was last modified on 24 May 2017, at 16:21.